Photo courtesy of Toyota Motor Corporation. Toyota Motor Corporation and Panasonic Corporation have signed a contract to establish a new joint venture company by 2020 related to the automotive prismatic battery business that will be 51% owned by Toyota and 49% owned by Panasonic. The joint venture aims to become the leader in battery-development and battery-manufacturing capabilities. As vehicle electrification accelerates, batteries are an important element. However, numerous battery-related challenges must be tackled, including not only having advanced technological capabilities to address issues of cost, energy density, charging time, and safety, but also being able to ensure stable supply capacity and having effective recycling structures. The business environment is one in which independent efforts by battery manufacturers or automobile manufacturers are not enough for solving the issues concerned, the two companies said in a joint statement. Against the backdrop of such a business environment, Toyota and Panasonic announced on 13 December 2017 an agreement to study the feasibility of a joint automotive prismatic battery business. Since then, the two companies have achieved high-capacity and high-output automotive prismatic batteries that lead the industry in terms of both performance and cost. 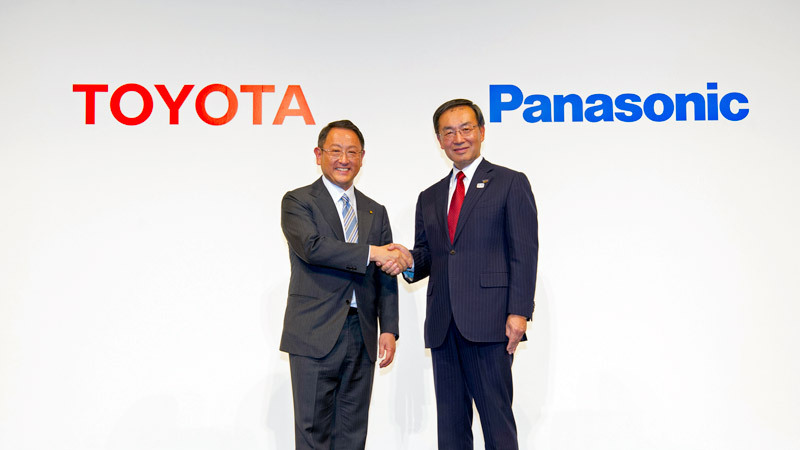 To contribute to the popularization of Toyota’s and other automakers’ electrified vehicles, Toyota and Panasonic have also repeatedly held earnest discussions on the concrete details of their collaboration. The deal is subject to approval from competition-law authorities in the countries and regions concerned. The total number of employees from both companies related to operations subject to transfer to the joint venture is 3,500.